Our iconic HOT Glass Class is our signature program designed to bring the experience of glass-blowing to the South Florida community in the most hands-on way imaginable! We developed this program to bring an unparalleled hands-on glass making experience to our visitors. Choose from a variety of workshop options to initiate yourself in the art of glassblowing, always working hand in hand with our professional instructors. Celebrity Cruises is pleased to announce the addition of Hollywood Hot Glass onboard their award winning ships. Guests will now have the opportunity to shape their experience – literally – with hands-on, interactive classes. Take a look at our galleries below and shop easily with PayPal. Designed and made by Brenna Baker. Custom designs for every taste. Bring life into any room, art gallery or exhibition. Cast a surreal atmosphere into your restaurant, business or home. Show your festive spirit with our Christmas decor. Give the Gift of Glass. Visit the team today in the center of ArtsPark in Hollywood, Florida, to experience the wonderful art of glass yourself! Our group sessions and private lessons are chances to learn the ancient art of glass-blowing at a very fair price. Our experienced artisans make learning the basics a fun, engaging process – it may just lead to your new hobby or obsession! Hollywood Hot Glass is dedicated to sharing the beautiful art of glassblowing with the world. In this ten week intensive course, you will learn the fundamentals to create items from colorful paperweights to beautiful ruffle bowls. Save your seat ASAP! Schedule a private demonstration and watch as our artists fascinate and educate you on the ancient art of glass blowing. Great for groups of any kind. The Your Designs Made by Us program is designed for school groups and birthday parties to enjoy an educational demonstration. After everyone submits their design we choose a winner and make their piece into glass for the whole group to see! Our new Cremation Creations program offers the opportunity to commemorate and memorialize the life of your loved one or pet in glass to cherish forever. Learn more about our passion: creating incredible glass pieces of art! Watch Brenna Baker create a glass Piggy Bank on Handcrafted America. A throwback to our humble beginnings. This television segment presents Brenna Baker on Dale Chihuly and The Art of Glass. Glassblowing and science team up on this Nat Geo segment. Glassblowing inspires Pre-K kids on this KidVision featurette. Schedule one of our free live demonstrations at the center of ArtsPark in Hollywood, FL. Don't miss Hollywood Hot Glass on the new season of Handcrafted America this fall. This week's Keeping Up with Chris segment kinda blows. It's true — Chris is trying glass blowing. Proud to introduce the Team! Call or email to schedule a private lesson, party, field trip, and or banquet anytime outside of hours as well! Brenna Baker is the Founder and Artist of Hollywood Hot Glass. She began her career as a glass artist in Corning, NY at the young age of 14. Learning the technical and aesthetic foundations of glass in Corning inspired her to live out her life's dream of becoming an independent glass artist. The next few years she spent working under many talented glass artists all over the US while simultaneously studying business. She then continued her career on to the island of Murano, Italy where she spent one year working under Maestro Pino Signoretto, commonly known as the world’s greatest glass sculptor. She then continued traveling the world creating her work for an audience on cruise ships with the Hot Glass Show before becoming the youngest Master Gaffer and only the second female gaffer ever employed by Steuben Glass. Brenna also gained knowledge and expertise in taking classes and teaching through The Studio of the Corning Museum of Glass. 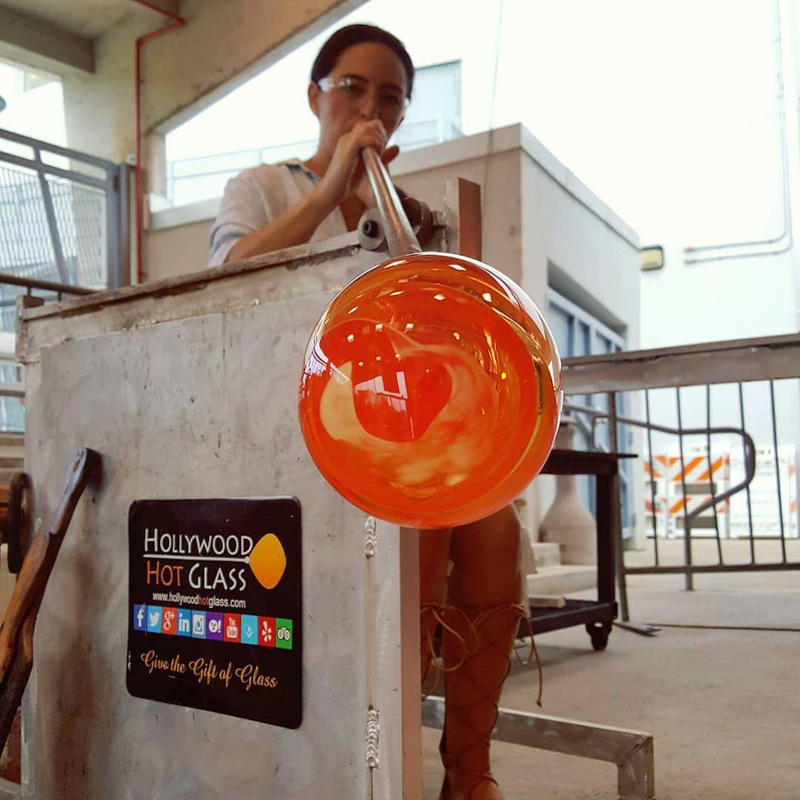 Brenna founded HOLLYWOOD HOT GLASS on June 7th, 2013. 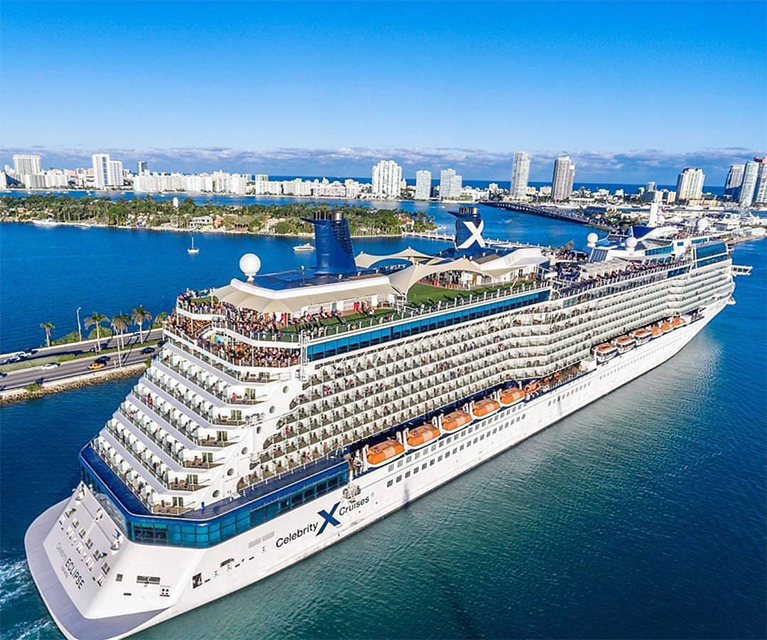 In 2018 Hollywood Hot Glass partnered with Celebrity Cruises to bring the glass making experience onboard the Celebrity Solstice, Equinox and Eclipse. Located on the top deck of each ship is a beautiful glassblowing studio surrounded by a half acre of real grass looking out over the world. Through Brenna's Hot Glass Class program guests traveling with Celebrity now have the opportunity to sign up and make a beautiful piece of glass art themselves! "Thanks to our amazing teams, I am extremely grateful to have the opportunity to share our passion every day with so many people all over the world. It is a true honor to witness the joy the glass making experience brings everyone and is by far the most rewarding part of my career today. Their happiness inspires my creativity and I hope, through our program, we can do the same in return." Chris Brown is the Director of Hollywood Hot Glass INC. and all Hot Glass Class programs. He is a natural team leader and passionate about everyone's success within the company. Chris holds a degree in business from Johnson & Wales University with studies in event management. As the Director, Chris looks after, coordinates, manages, and leads the team providing all aspects of business development and human resources. After a successful career in business management, Chris now coaches, teaches and advises our team on how to achieve the same success. Chris is also a big believer in not only the art of glass but also in the ongoing growth and education of its history. Christina Caron is the Business Manager at Hollywood Hot Glass. Christina recently relocated to Fort Lauderdale from Portland, Maine after living there her whole life. After graduation from the University of Maine with a Bachelors Degree in Psychology, Christina worked in a Montessori preschool. After a few years in the workforce, Christina decided to pursue her MBA in Human Resources. Growing up in Maine with an artist for a mother, Christina is familiar with the studio scene. She attended gallery openings and spent time playing in her mothers studio as a child. 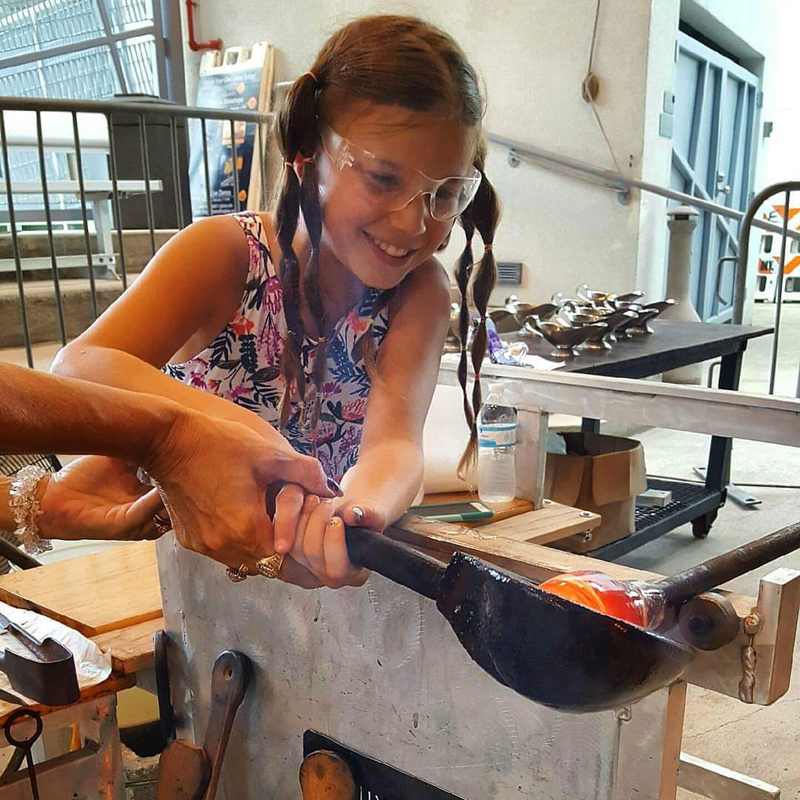 Christina is eager to learn more about all the exciting things the world of glassblowing has to offer. When she isn't at work, Christina loves to head to the beach with a good book in hand. She also loves spending time with her four month old Pug puppy, Rosie. Anissa White developed a passion for glass blowing during her undergraduate studies at the University of Hartford, Hartford Art School, where she received her Bachelor of Fine Arts degree. After taking her first glass blowing class, Anissa fell in love with a medium that was both a challenge and excitement to work with. After taking several years of hot glass fabrication classes Anissa developed a style of work that ranges from intricate flora imagery to functional work including vases, cups and various vessel forms. She brings a playfulness to her forms through exploring color application techniques. Assistant teaching two workshops and a winter intensive course at the Hartford Art School brought Anissa off the bench and onto the floor of the shop where she discovered teaching students techniques and forms brought her as much joy as creating her own art work. Anissa is not only a talented glass blower, but she is also a very gifted ceramics artist. 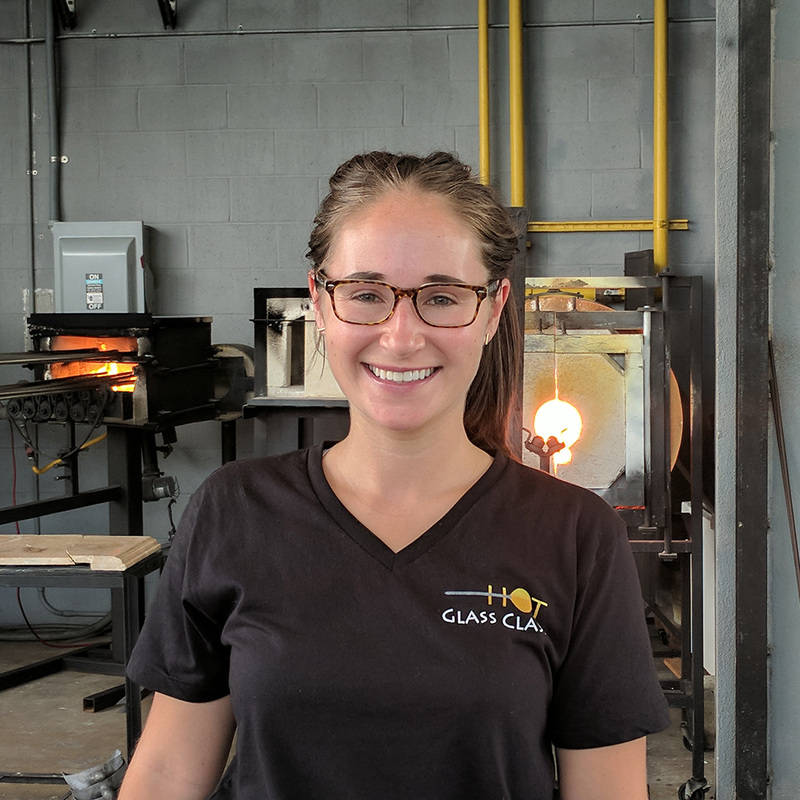 She is very excited to be able to share her passion for the art of glass blowing with the patrons of Hollywood Hot Glass as she continues to grow as an artist. One fateful day in the summer of 2013, Hollywood Hot Glass brought another mind into the fantastic world of glassblowing: Richard Dextraze. The flames from forming his first soft glass flower ignited the furnace in his heart, and with his new found passion, Richard began exploring all the gifts that glass has to offer. Over the next few years, he developed his love for glass into a hobby by flame working in boro silicate. While pursuing his degree in Economics, Richard found his way into the soft glass studio at the University of Miami, where he learned from Jenna Efrein. He gained experience as a glassblowing instructor in her High School Outreach program and was inspired by the experiences he had bringing new artists into the fold. As a part of the Hollywood Hot Glass team, Richard wants to do everything he can to help make Glassblowing more accessible to the public. After forming the instant connection with the material in the way that he did, Richard hopes to share the same freedom of expression he feels every day thanks to the amazing fluid medium we call Glass! Joseph Falzone first discovered his love of glass at the young age of eighteen. Having been an artist his entire life, he was no stranger to the creative process. However, it wasn't until he was exposed to glass that he truly felt like he could express himself through art. After his first glassblowing experience at the University of Wisconsin River Falls, he knew this was the medium he had been looking for. Joe continued his glass education at Penland school of crafts. He had the opportunity to study under an established glass artist and get a first hand look into the professional world of glass art. He went on to earn his BFA degree at Southern Illinois University where he perfected his technical skills and learned about the many different styles and traditions in blown glass. He also studied overseas, at Abate Zanetti in Murano, Italy. Currently, Joe enjoys traveling and teaching, finding inspiration for his work from the places he visits, and from the enthusiasm of his students. Jeff Mick was born and raised on the eastern shore of Maryland. When he first saw the glassblowing craft on a family snowboarding trip to Vermont, he went on to major in glassblowing at Salisbury University with fellow Hollywood Hot Glass artist Brian Binkley. Jeff returned to his alma mater after graduating to hone his skills as the glass programs' teaching assistant and studio tech. Jeff's work ranges from functional vessels to sculpted glass art and even includes the use of neon with soft glass blown forms. He has taken classes at the Corning Museum of Glass focusing on the use of murrini, detailed sandblasting using photosensitive decals, and sculpting. Additionally, he has worked for private studios in Maryland as well as Florida. After a short break from the hot shop, Jeff rediscovered his passion for glassblowing as a community artist at Jacksonville University before joining the Team at Hollywood Hot Glass. Spending many years working as a chef, he claims, "glassblowing is just like professional cooking. It all comes down to heat, timing and communication. Sometimes the glass you've been gaffing for an hour and a half breaks at your feet; sometimes you burn your eggs." My name is Yashu Reddy. I am a glassmaker from Central Pennsylvania. I was introduced to the art of glass at Harrisburg Area Community College in 2012. Since then, I have worked at numerous studios in the state of Pennsylvania and New York, including Goggleworks in Reading, PA, and the Corning Museum of Glass Studio located in Corning, NY. The visual arts and music are a big part of my life and working in glass has been my main activity and career for the past 5 years. As a glass maker, I appreciate forms and functional objects that have been refined and redefined throughout history. Though I am still very much a student attempting to find a voice and develop my own ideas within this fascinating medium, I make the majority of my living by sharing the intrigue of glass with individuals who have never had the opportunity to see or partake in the magic and alchemy that it is. Bailey Marhoun is a 2-dimensional turned 3-dimensional artist. As a child she would copy the cartoons from cereal boxes or draw and photograph the flowers that grew outside her rural home in Wisconsin. However, this artist did not truly blossom until her college years when a twist of fate landed her in a glass blowing hot shop. She found that she loved the way she could portray feeling an emotion through manipulating glass and building mixed media sculpture. It's been nearly 7 years since she started learning this craft and she never wants to stop. Glassblowing has allowed her to travel the U.S., and she's excited that it's allowing her to travel the world! Other than glass blowing, Bailey loves her family, reading, body art, silly socks, cats, and anything Harry Potter related. Erin was drawn to glass at the University of Nebraska at Kearney. She was an accounting major looking for a fun class to take and stumbled upon glass blowing in the course catalog. She fell in love with the process immediately and enjoyed that she could create something unique in a relatively short amount of time. Perfect for Christmas presents. After graduating with her accounting degree, she started working at the Corning Museum of Glass. During her 3 years there she taught small classes with beginners, assisted independent artists, and helped as a technician. She enjoys the mental aspect of glass. It forces her to clear her mind, stay calm under pressure, and problem solve. She has been striving to perfect simple shapes and designs and is excited to experiment with new color techniques. When she is not in the hot shop she enjoys rock climbing, driving her 1980 Puch moped, and hanging out with friends and their puppies. She is joining the Hollywood Hot Glass team to teach classes on Celebrity cruise ships. She is excited to meet people and introduce them to the magic of glass. Victoria (Torey) Buckland started blowing glass at Salisbury University in MD in 2009. She fell in love with the medium so much that she changed her major so she could learn more about it. Torey graduated with a BFA with focus in glassblowing in 2012. After graduation, Torey started to learn different processes of making glasswork using a kiln. She continued blowing glass in Baltimore, MD, and selling and displaying her work in art shows and galleries. In 2015, Torey accepted a position as Studio assistant at the Corning Museum of Glass in Corning, NY. She worked at the studio for three and a half years. In 2018, she teamed up with Hollywood Hot Glass for a new adventure, blowing glass on a cruise ship and traveling the world! ​Logan Brooks had his first experience with hot glass in 2006 at a small private studio in Ypsilanti, MI. He began taking private lessons in his free time while he was still in high school. Logan continued to study this organic medium at The Cleveland Institute of Art, where he received his BFA in Glass in 2011. After graduating, Logan has continued to pursue his career as a glass artist by working for a variety of glass studios and master artists. He has been spending the majority of his time in the studio maintaining equipment, creating production glass, assisting artists, teaching classes and building his own portfolio of glass art. Now a proud member of the Hollywood Hot Glass team, Logan is excited to share his passion and experience with individuals around the globe, through the Hot Glass Class at Sea program, onboard Celebrity Cruises. ​Mandie Gittelman is a creative artist and glassblower raised in Havertown, PA. She went to school at Salisbury University and graduated with a Bachelor of Arts in Graphic Design in 2013. When Mandie was in her second semester of her junior year she took an elective glass class and was hooked. Mandie spent every second she could blowing glass after that moment. Painting and glassblowing are her two true passions in life, and within these mediums she enjoys incorporating aspects of nature and free flowing elements. She works with a very colorful palette in her art and everyday life. After graduating college, Mandie traveled through Australia and South East Asia for seven and a half months. When she returned she jumped head on back into glass and hasn't stopped since. She took two classes at the Corning Museum of Glass and a class at East Falls Glassworks in Philadelphia. In 2015 Mandie moved to Corning, New York and began blowing glass seasonally at the museum in the Make Your Own Glass, Fun with Glass, and Studio Technician departments. She remained there for three and a half years, working, taking classes and Teacher assisting, until accepting the job with the Hollywood Hot Glass at Sea program. Native to New Jersey, Kate found glassblowing after a long career of 18 years as a swimmer. After swimming came to an end, she went on to seek out something she was just as passionate about; that's when she started working at GlassRoots. GlassRoots is known for their philanthropic outreach, teaching and mentoring local underserved youth in the arts. It was there that Kate developed her skills under numerous glass makers in the tri-state area. Her desire to utilize glass as an artistic medium led to her enrollment at the Appalachian Center for Craft where she earned a Bachelor of Fine Arts degree. From there she then went on to work for some of the most skilled glass makers in the United States. Glassblowing has the unique opportunity to take you places you never imagined. Celebrity and Hollywood Hot Glass has given her one of those rare opportunities to blow glass while traveling the world! The first time Spencer worked with glass, he was hooked! The material was mesmerizing yet required a sense of focused attention and precision movements. His journey began in 2009 on a visit with his father to a glassblowing studio in Denver, Colorado. This experience opened a creative outlet he had never known before. The passion grew over time and after 2 summer courses at Pilchuck Glassblowing School, he left the mountain lifestyle of teaching skiing, climbing, and kayaking to pursue glassblowing full time. In 2012, he worked as a production glassblower for Simon Pearce providing him some basic skills to move forward. From there he moved to Texas where he learned a broader set of glassblowing techniques and applications including custom lighting as well as sculpted and blown art glass. After 5 years at Vetro, Spencer plans to continue expanding his experiences with glass and is excited to be teaching glassblowing aboard Celebrity Cruises with Hollywood Hot Glass. Working with Hollywood Hot Glass and teaching their signature 'Hot Glass Class' provides an amazing interaction with students creating glass art. Andrew Lombardo is a Business Consultant for Hollywood Hot Glass INC. as well as a part time artist. 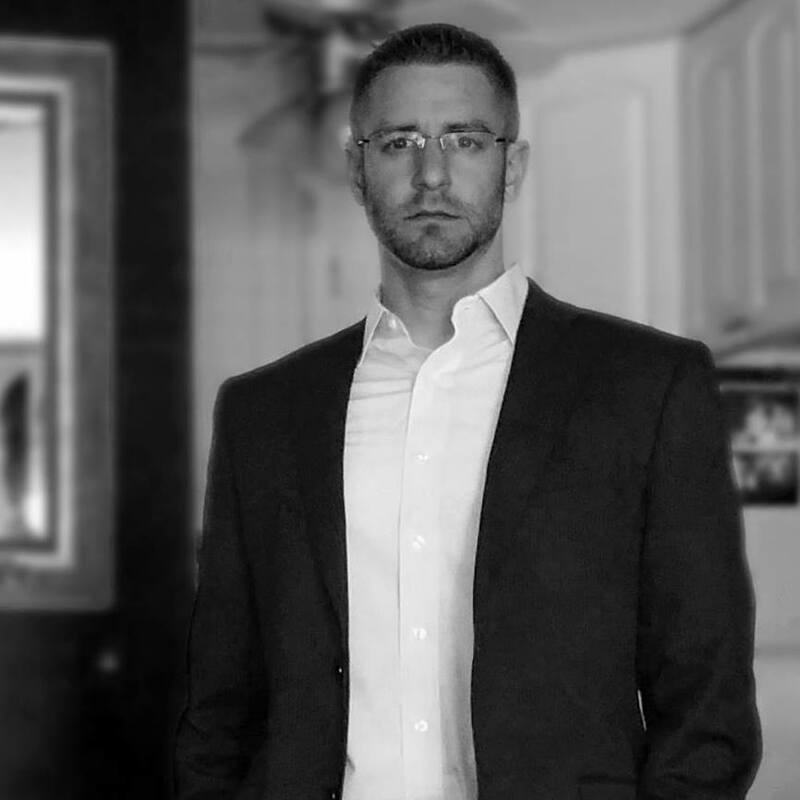 Andrew holds a bachelor's degree in Paper Science and Engineering, along with master's degrees in both Business Administration, concentrating in business policy and strategic management, as well as Applied Physics with a concentration in Nanotechnology and Material Science. As the Business Consultant, Andrew helps with various tasks throughout the business as needed and can be seen in the shop random evenings doing demonstrations in glass blowing. His passion for creating started at a young age with music, learning to play the piano as well as guitar at an early age, and has spread to other works such as painting, woodworking, wood turning, digital art, science writing, photography and now glassblowing. Andrew has been blowing glass and working with Hollywood Hot Glass INC. since January of 2016 and is passionate about the business and spreading the love of blowing glass to the community and the world. His personal portfolio can be seen here: www.awltiedup.com.